A Mandroid is a heavily armored personal combat suit originally designed and engineered by Stark International for use by SHIELD. Now manufactured by Stane International, the Mandroid armor is primarily used for protection against opponents who possess superhuman powers. It's not just SHIELD who used Mandroids, though. Glenn Talbot wore the armor to fight the Hulk, and a villain named Moses Magnum got his hands on the plans and used the Mandroids to attack the X-Men. So basically, it's like a big gun: whether it's good or bad depends on who's using it. And 90% of people should never be trusted with one. The seven pieces to build the Mandroid are included with the figures in the Captain America series of Marvel Legends - including the AIM and Hydra swap figures, so if you buy the whole shebang, you end up with two extra arms. Two legs, a torso, a head, a gun, and four arms. The pieces snap together tightly, but you might be able to get them apart again - we're not stupid enough to force them apart just to find out. 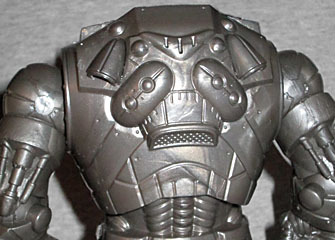 The defining feature of the Mandroids has generally been their flat, dome-shaped heads. That may sound like a contradiction, but think of Hulkbuster Iron Man. Got it? Yeah. Anyway, along with the domey head, there was a narrow, triangular eye slit, and this toy duplicates both those features really well. In fact, the head sits so low in the chest that it's barely higher than the shoulders at all! 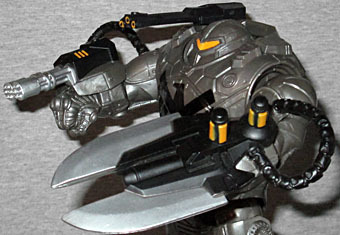 For the most part, the Mandroid is the same mold as Iron Monger, but the upper torso is completely new. 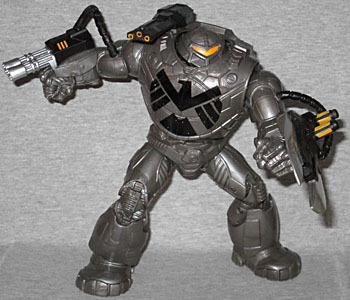 Rather than Iron Monger's vaguely anatomical look, the chest is basically a big round drum with the SHIELD logo painted on the front and a jet booster sculpted on the back. There are lots of panel lines and seams in the armor, but none of them are shared with previous instances of this mold (in either the 4" or 6" scales). There are no coverings of any sort on the shoulders, so the arms look a little disconnected - like they're "floating" away from the body a bit. The articulation is pretty much the same as it was on Iron Monger: ankles, knees, thighs, hips, chest, wrists, elbows, shoulders and neck. The biceps look like they should be joints, but they're not. And since the head sits so low in the body, it's hard to get it to move - though it's on a balljoint, so it does have a full range of motion. The figure stands about 7½" tall, depending on how you pose it (and whether you measure to the top of the head or the top of the gun). 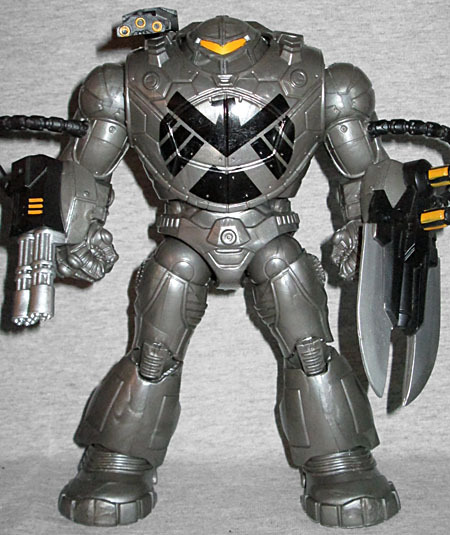 While the "standard" Mandroid was a little over 7' tall, there were a few versions that were much larger, so this figure could work for either Marvel Legends or Marvel Universe. Mandroids are one of those pieces of equipment that only shows up every so often, and are generally dispatched fairly quickly; they're not a major threat, they're like... glorified jeeps. 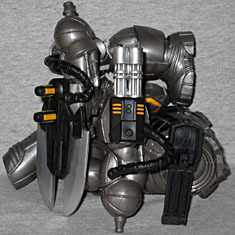 The toy is fun though, and will look good backing up other SHIELD Agents in a battle.